As the weather warms up, most homeowners begin budgeting for potential roof repair or replacement. Winter weather is one of the primary sources of roofing damage, and your potential customer’s property almost certainly sustained some extent of its damage during the coldest months. 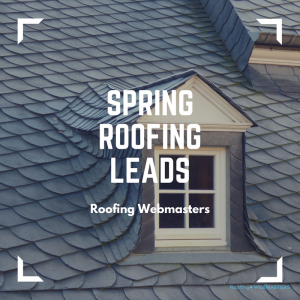 Capturing leads during spring also allows roofers to fill their schedule for the rest of spring, all of summer, and the beginning of fall. Booking jobs in advance prevents down time, and encourages a consistent flow of revenue, which helps your company reach its business goals in 2018. Roofing Webmasters is the premier online marketing service for lead generation. The leads produced from our services are exclusive to your company and empowers you to set a schedule for your peak business months. Maximizing your market reach allows you to secure leads from every channel imaginable. Whether it’s Google (SEO), content marketing, or social media, the returns will be favorable. Each of our clients receives a custom website, optimized for mobile devices. Investing in marketing services is not a decision to take lightly. After all, the quality of your choice will likely make or break your 2018 numbers. With this knowledge, trust should be a top priority. Who better to trust than a company that works with roofing contractors all of the time? As you might have guessed from our name; Roofing Webmasters, we specialize in internet marketing for roofers. With experts in web design, PPC, and SEO, we can help you secure leads in 2018. Call (800) 353-5758 for exclusive roofing leads.